Did I mention that I’m kind of obsessed with s’mores? S’mores in a jar, s’mores pop tarts, s’mores cupcakes, s’mores brownies…I’ve made them all. So when I had an itch to bake a couple Sundays ago, I went searching through my recipe folders to see what I had bookmarked lately. 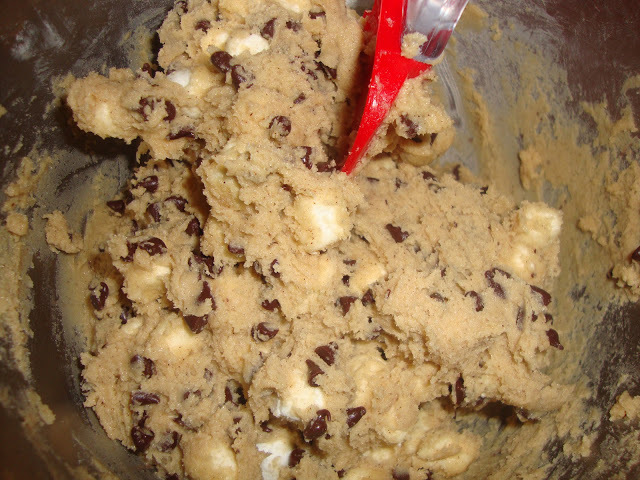 And there it was…this amazing recipe for s’mores cookies. Even though there was only a couple of photos with the recipe, it was enough to get me drooling. These are probably one of the best cookies I’ve ever made. Honestly. My co-workers were raving about them. I made about 25-30 of them and they were finished before the end of the day. Even the one’s who weren’t super into sweets couldn’t get enough. At first glance, this cookie looks like a regular chocolate chip cookie dough with marshmallows mixed in and a piece of chocolate on top. No no no, my friends. 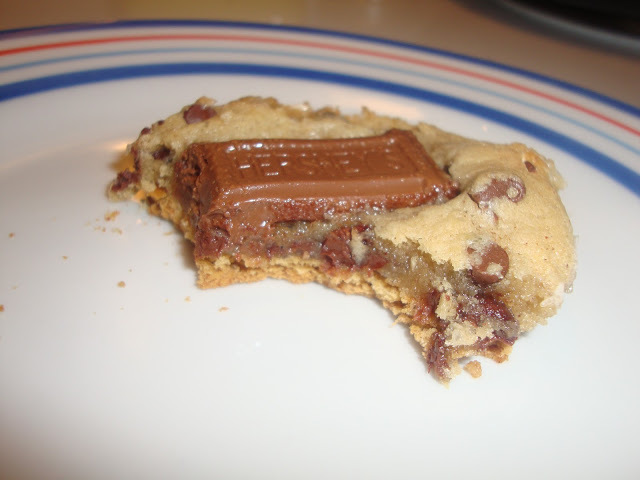 There is so much more to this cookie than meets the eye. The dough has a dash of cinnamon in it to resemble the flavor or graham crackers AND the dough is also sitting on a graham cracker square. Unbelievable. But the true shining star in this cookie is the marshmallow. As the cookie bakes, the marshmallows within caramelize a bit to give them the burnt, smoky flavor that distinguishes a s’more from a plain Jane cookie sandwich. Again, unbelievable. You have to make these. Now. Somehow I got confused as to which bowl I was putting the brown sugar in and placed it with the dry ingredients by accident. Oops! Good thing brown sugar packs together ever so perfectly so getting it out was a cinch. Fold in chips and marshmallows. Place tablespoons of dough on each graham cracker square. Press down slightly with fingertips. Chewy chocolate chip cookies with a hint of cinnamon and a bunch of marshmallows baked on a graham cracker and topped with a piece of milk chocolate. Preheat oven to 375 degrees F. Line two rimmed cookie sheets with parchment paper. Lay out graham crackers side by side on the pans as close as possible (they should be touching). 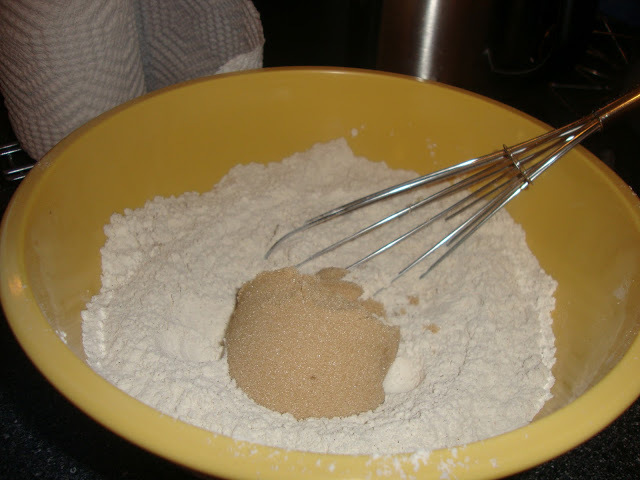 In a medium bowl, whisk together the flour, baking soda, salt and cinnamon; set aside. In the bowl of a stand mixer fitted with the paddle attachment, cream butter with both sugars until light and fluffy, about 2-3 minutes. Beat in egg and vanilla. Reduce the mixer to low speed and add the flour mixture, mixing until combined. 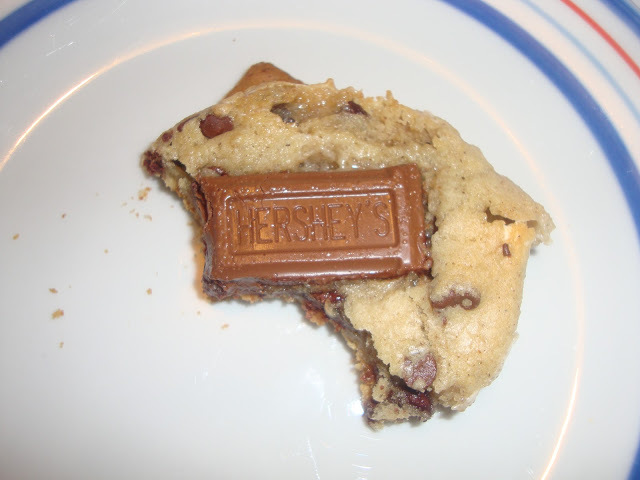 Bake for 9 minutes then remove from oven to press Hershey’s bar pieces on to the top. Return pans to the oven and bake for 1 to 2 more minutes or until dough is golden brown at the edges.